Agree, just a touch of grain water would prob be OK. It was memorable because I made so much, like a liter and poured a bunch of plates plus put some away in sterile jars for pouring later. I later flipped some of the plates to prevent condensation and found that the agar slid off. Took me a while to figure out what had caused it. Edited by raymycoto, 27 February 2019 - 04:25 PM. Try just adding a spoonful of the target grain to whatever amount of water, boil for 10 minutes or so along with any non soluble ingredients. Strain, adjust water to appropriate amounts and do the agar step. For condensation, I first add bit more agar, I allow the freshly poured agar to cool well before the pc. I don't pc for longer that 20 minutes. A proper pc run that is. And let them cool in pc till cold. I still get some condensation but not enough to "pool". I get no condensation(with "no pour" jars) by letting the agar completely cool and stiffen, then wipe the inside glass with a paper towel before putting the lids on the jars. The key is that it is completely cool, then PC for 45 min. I pressure cook my agar in a bottle and then pour plates and hour after it cools. Perhaps I'm doing it backwards. Day 8 update. The bottom left of Malabar looking oh so nice! It looks to me that the TTC plate is just bacteria. That's the traditional and a fine way to do it. Best if you have a hood or nice SAB else you will catch various nasties since you have to leave the plates open for a while for cooling. Here's what I do. I refurb lab equipment so I an lucky to have these tools at the moment. It's for sale but I hope I don't sell my autoclave anytime soon. 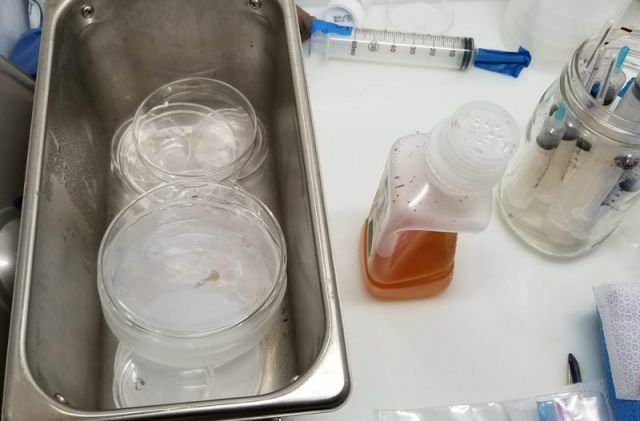 Here I'm making a bacterial specific agar to track down some recurrent bugs. 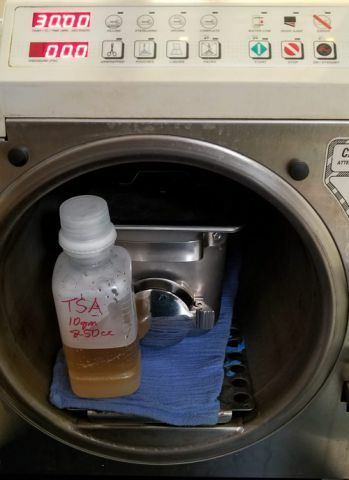 Use PDA or variations we have discussed for fungal culture instead of TSA. Plates in this carrier is handy or I would wrap them in a breathable towel for the PC. Use either an autoclave liquid cycle or make sure you cool the PC gradually (just don't vent it. let it cool on its own) to prevent boil over of superheated agar or any liquid you might be sterilizing. Hot plates and sterile agar out of the cooker. I left the top a bit too tight on the agar bottle and it sucked down but no worries. Those saline bottles are great for agar! They are PP5 plastic and have a narrow, easy pour mouth and a good sealing screw lid. Poured plates waiting to cool in a sterile lami flow area. 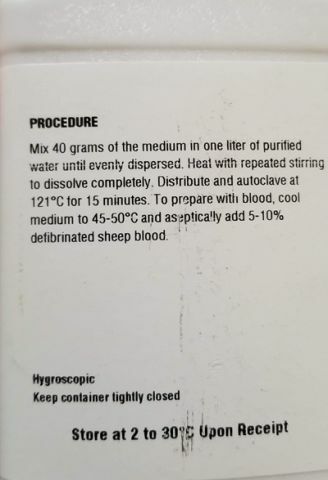 In theory, you could let your agar cool in the bottle to around 50-60C then pour for quicker cooling. 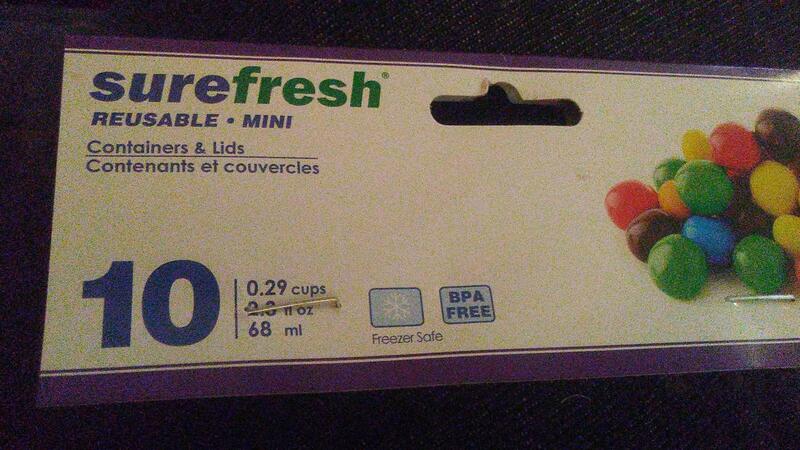 BTW, seal the PP5 bottle immediately to keep sterile. To reheat, I put it into 1" of water in a large stock pot on the stove and simmer for about 15 -20 minutes until it liquifies. Edited by raymycoto, 28 February 2019 - 09:38 PM. Yes sir I concur. 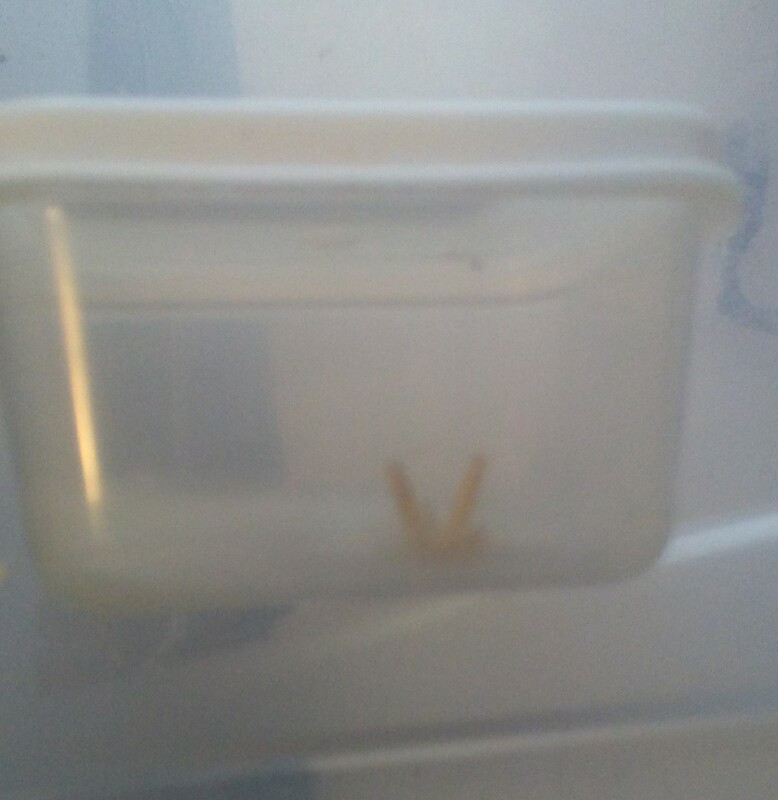 It is Texas Yellow Cap from a friend and he admitted it was a super slack syringe, like 1 little glob of sporea. I knocked up some BRF jars with the rest of it last night. Not sure if it is just a low spore producing strain or what. Great idea. I like the idea of screwing the band onto the jar over a plastic bag. I might use saran since it may be more clear. I may try that on those 'squatty' jars soon. I wish they had a totally flat bottom rather than the upward dished bottom. Takes more agar that way. If you use the anchor hocking square jars ,1/2 pt you have good visibility better than round jars. The decorative squatty jars I thought were better but visibility is distorted due to convexity so I moved away for those. It is deceiving to think you can see better with the squatty decorative jars but the square jars are best for the no pour method IME. I have gotten away for the most part from plastic petris for recycling reasons but use them on special occasions when I need to clean up a culture that I know is wild. Let me tell you from a stubborn person. I could tell you stories. It is best to embrace change and go back to basic teks when things don't work out rather than having a bunch of contaminated jars and grain. I recently for the hell of it revisted WBS and Popcorn. WBS seems to be too sticky. Popcorn works but alternating between Rye, Winter wheat and Oats works best for me. To each his own. Edited by Seeker2be, 01 March 2019 - 02:16 PM. I'm pretty much sold on these. I've run them for 15 minutes and for 25 minutes, no issues. I do use a small vent hole with micropore because I was afraid they would collapse. 10 for $1 at Dollar tree. Do I want to let the whole plate grow out before I move it to some grains or is this sufficient ? Don't think I am going to isolate it or Sector anything out on these apes until I get some good fruits. Edited by NotFadeAway, 01 March 2019 - 06:49 PM. I would take a chunk of the largest one and inoculate the grains with it. Vigorous growth is what you want. You are correct about cloning the fruiting body. This will give you the best selection of genetics. If that is the mult-spore inoculation/streak, I would advise to do at least one transfer to a few plates just to be safe before taking to grain. They look good and clean, but there could be a hidden hitchhiker you can’t see. It’s better to waste a tiny bit of agar than ruin a bunch of grain jars. 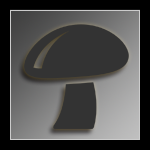 Mycelium will grow over certain bacteria, so it’s just a precaution. 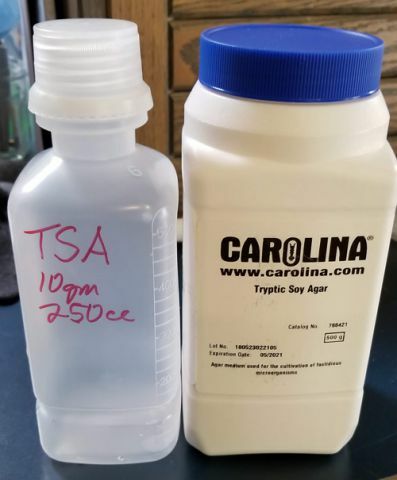 You don’t have to do it, but I highly recommend it to insure the cleanest inoculant gets started for your grain master/spawn. Good vibes and they look great. Yes, do that and you could also use the remainder to noc a jar or two. Make transfers to two or more plates - I like to do three tiny chunks to a 90 or 100 mm plate spaced out in a triangle but about an inch or so from the edge of the plate. I always like to do more than one plate since one plate may pick up an aggressive contam (not necessarily from the transfer, either from the agar or from the atmosphere) that will wipe it out. Then you can sort of 'over noc' a couple grain jars with half each of the remaining agar. 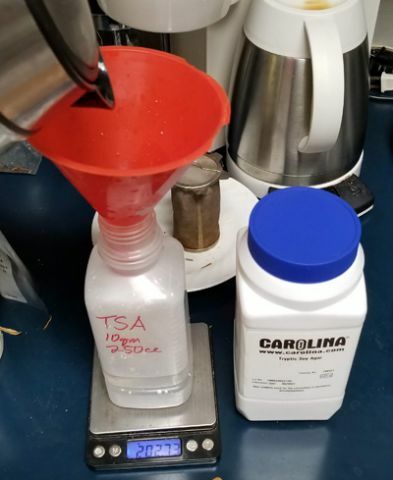 Since it is early in the iso process, the added agar to grain will help in the event that there are hidden bugs. And maybe save just a tiny piece of the original plate in case everything fails. I've learned to keep lots of options open. But that plate looks really nice. Great job with your technique so far. I think all these paths will work. You could let it go another day or two, or not. Contams can pop up anywhere but environmental contams seem to have a preference for the edges IME perhaps from either air that has entered or from condensation run down from the top. Edited by raymycoto, 01 March 2019 - 10:11 PM. Frog has an excellent point. Another transfer is a great idea for the reasons described. However, if you want fruits asap I don't see the harm in trying to start 1 or 2 jars from that plate. Since it's MS, assuming its clean, you might get lucky and find a fruit worth cloning first try. Those plates look great, BTW. I love seeing people try out new things and get good results. Yeah that is one prob with those squatty jars have that regular 1/2 pts don't is the bumped up bottom. They work well still, and before I started using the plastic baggie instead of the lid disk I was never able to really see all the sectors. Some more experienced guys than I even have a hard time seeing them sometimes, I've seen people's pics of what they are calling single sector, then someone points out that there are still sectors there, just hard to see, so the baggie helps if you don't have petris or something else with a clear lid. I have seen people use the PCable conoments dishes for no pour plates, seems good. Edited by Billcoz, 02 March 2019 - 06:57 PM.